Egypt. Another Uprising! Another nation of people fed up with with their immovable dictator. On January 15th the President of Tunisia had done what deposed dictators did - he’d fled the country - as the news sources say. Who knows if Egypt’s 30 year dictator will finally step down or create heavier reprisals, using thugs loyal to Mubarak. Today I read Thousands including families with children flowed over bridges across the Nile into Tahrir Square, a sign that they were not intimidated after the protesters fended off everything thrown at them by pro-Mubarak attackers . Many of us have cheered the protesters on, signed petitions, and joined virtual and actual demonstrations in support. And we resuscitate hope. people die of a bullet wound on-screen. 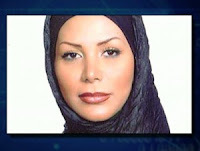 Her death by thugs loyal to Ahmadinejad signaled the abuses of power and repression that would follow. Many of us had cheered the protestors on, signed petitions, and joined virtual and actual demonstrations in support. And we resuscitated hope. 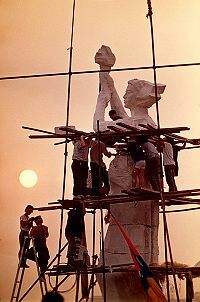 And we remember the 10 foot Spirit of Democracy, erected in Tiananmen Square in 1989, when there were 10,000 demonstrators, and how that spirit, (That Spirit! ), created 300,000 more demonstrators in the following days. And millions of us saw the tank that pushed Her over - how the torch struck the ground first, breaking off - as thousands were injured, and thousands died. Months later, without a single life lost, the symbol of all that was divided , the Berlin Wall, came down. I have been reading The Discovery of Heaven, by Harry Mulisch. In it, Lucifer has recruited Francis Bacon, founder of the scientific method. Ultimately, technologized humans turn away from God’s laws, and develop the tools that make pollution, mass slaughter and the Holocaust possible. Like a discarded fiancé, God wants the tablets He gave to Moses returned. Satan has won the final round of the bet that he originally made with God over Job. I did not like the Book of Job as a child. God allowed suffering and loss to befall Job, betting Satan that Job would not turn away from Him. When Job questions God, He answers by citing all the wonders of His Creation, all that He has accomplished, all the Powers He can call upon. What mere human could comprehend Him? But I couldn’t find evidence of Mercy or Compassion, and I had been taught that those were His qualities. It was just God and Satan in a struggle for power - just like Uncle Sam and the Russian Bear - and Job was the pawn. Yes But, you say - it is a struggle between Good and Evil. But what amorality and cruelty does Good resort to in its attempt to defeat Evil? What justifications? How many billions of us are still pawns of Power? Whenever there is an uprising, it seems as though some new light is shining in the world, and all the media turn toward this potential light and if it fails, there is dejection. The next uprising we cheer them on, sign petitions, and attend virtual and actual demonstrations in support. And we resuscitate hope. How do we hold the memory of light? How do we hold the memory of light? We remember light when we read your poetry, Leah. It forms a structure in which light can reside.